Sunday symposium took of at 8:30. Unfortunately i had to skip the first two session due to some work That had to be done first. 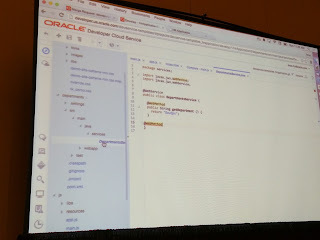 The first session I really got to attend was Brian Fry's session on Oracles Developer Cloud Service. 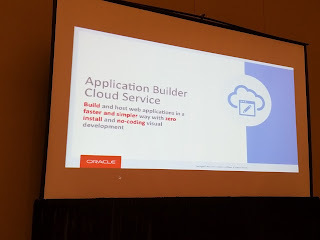 After lunch Lynn Munsinger, talked about Mobile Cloud Service aka MCS. She explained some of the concepts of mobile development and Mobile Backend as A Service. (MBaaS). Somewhere during this session there was a small hint about MCS being released maybe tomorrow during a live webcast. 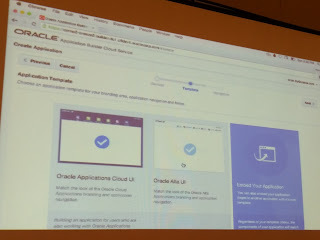 Next Lynn showed Oracle Mobile Cloud Service in a demo. 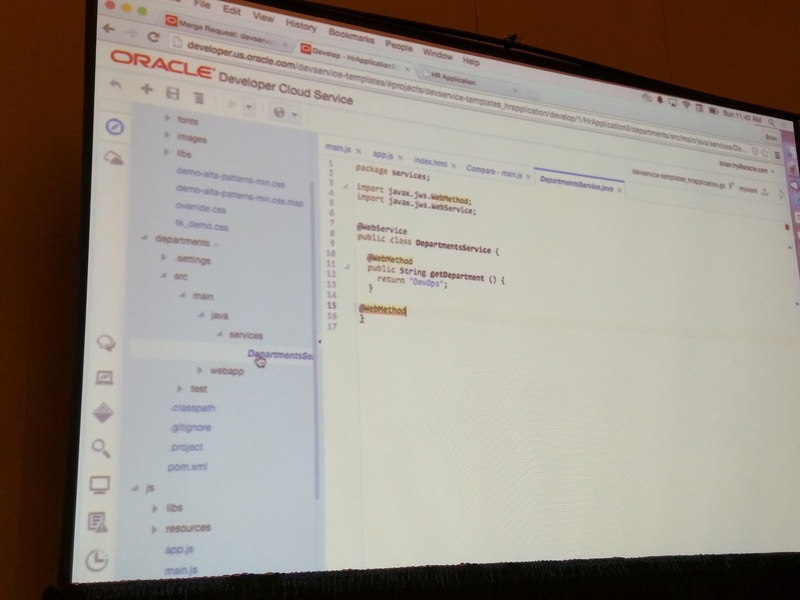 finally as a bonus, there was a demo of MAX, aka Mobile App Accelerator. 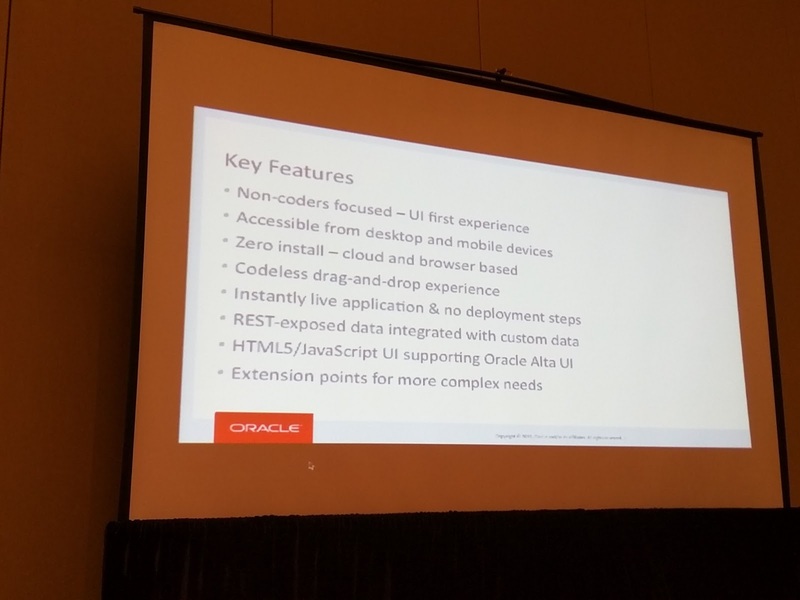 MAX is a part of Oracle MCS where a business user can actually create real mobile apps without coding. I have seen this before, but now it is going really close to being production. It might even be part of the first MCS release, that might be release tomorrow. The final session of the day was really worthwhile. In this session Brian Fry showed Oracle Application Builder Cloud (it is as easy as ABC) for the very first time publicly. I certainly hope there is more to come soon. For you the get a glimpse of what ABCS can do, you can look at the two video's I created. In one of my projects I ran into a requirement where the end user needs to be presented with default values in the table filters. This sounds like it is a common requirement, which is easy to implement. However it proved to be not so common, as it is not in the documentation nor are there any Blogpost to be found that talk about this feature. In this blogpost I describe how to implement this. Users of the application would typically enter today's date in a table filter in order to get all data that is valid for today. They do this each and every time. In order to facilitate them I want to have the table filter pre-filled with today's date (at the moment of writing July 31st 2015). How can we add a message programatically ? Last week I got this question for the second time in a months time. I decided to write a short blogpost on how this works. Adding messages is very easy, you just need to know how it works. You can add a message to your faces context by creating a new FacesMessage. Set the severity (ERROR, WARNING, INFO or FATAL ), set the message text, and if nessecary a message detail. The fragment below shows the code for an ERROR message. 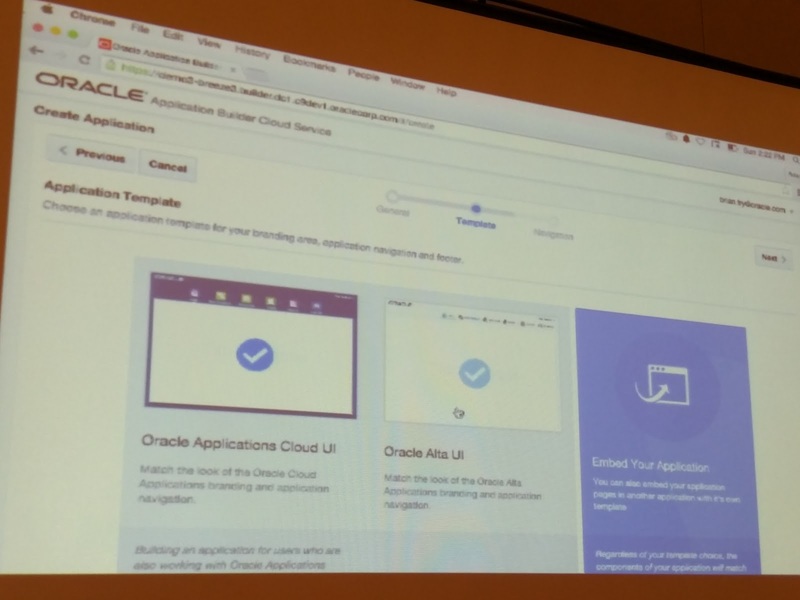 At Oracle Code One in October, and also on DOAG in Nurnberg Germany in November I presented on how to go beyond your regular chatbot. 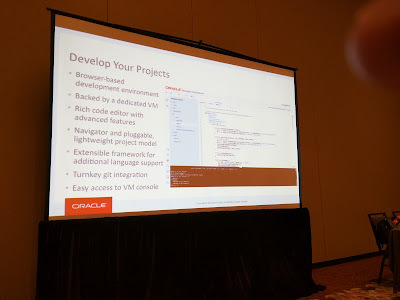 This presentation contained a part on exposing your Oracle Digital Assistant over Alexa and also a part on face recognition. I finally found the time to blog about it. In this blogpost I will share details of the Alexa implementation in this solution. Typically there are 3 area's of interest which I will explain. 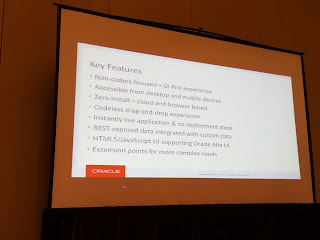 Webhook Code to enable communication between Alexa and Oracle Digital AssistantAlexaDigital Assistant (DA) Explaining the Webhook Code The overall setup contains of Alexa, a NodeJS webhook and an Oracle Digital Assistant.